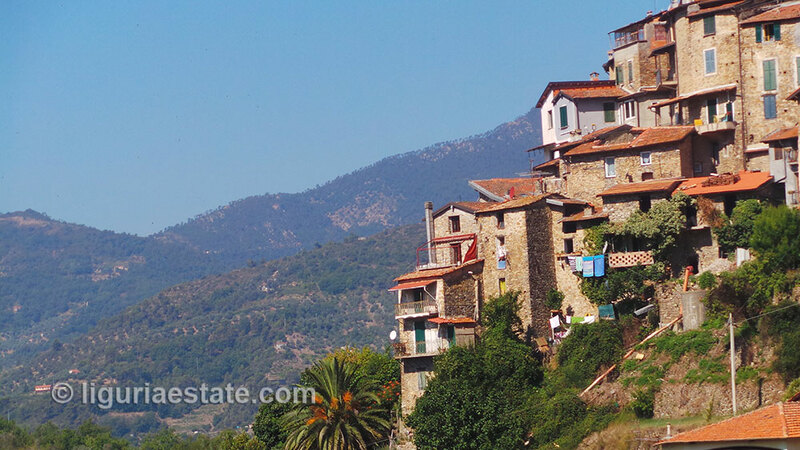 In the romantic historic medieval town of Apricale, one of Italy’s loveliest cities, are these two beautiful independent apartments for sale 105 m². Apricale is located in the province of Imperia (Liguria region). All primary facilities are present here such as; a grocery, a pharmacy, restaurants, bars, etc., and at a distance of only 25 min from the beach. The apartments are on top of each other located and are facing south with beautiful views over the valley, the river and onto Perinaldo. The top apartment has a very large and well modernized living room with kitchen, bedroom, a bathroom and a nice terrace. The apartment below is one large room with cooking area and bathroom of circa 25 m². The entrance is through a small court yard, where there is space to sit out and enjoy the sun. The apartments are very well qualified as holiday home with guesthouse or as investment property to rent. Although the apartments are in a fairly high standard and are directly suitable for habitation we can imagine that you might have refurbishment or renovation wishes. Liguria Estate has specialized over the past 10 years in acquiring local permits, constructions and renovations, Project Management and other necessary work. We are happy to serve you! If desired, our creative architect makes a wonderful design for your dream project.